Instead of the fairy-tale ceremony of most women’s dreams, Chan wound up with a wedding in her own back yard that featured $7.50 Mexican food. 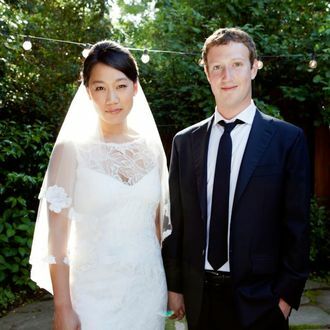 And now, she has an anniversary that will always be overshadowed by her hubby’s much-hyped and thoroughly disappointing IPO — the aftermath of which may or may not be the reason that the new bride was dining with friends rather than having been whisked away on a honeymoon. Chan also, of course, had to go through a few extra hoops to maintain her pre-wedding privacy, prompting this analysis. “Most bridezillas would be spitting fire.” People know bridezilla is not a complimentary description, right?